Robert: Welcome to the eCommerce Marketing Podcast. Today’s guest is Karon Thackston from http://marketingwords.com. Welcome to the podcast. Karon how are you doing? Karon: I’m great how are you? Robert: I’m doing well, thanks for asking. Today we’re actually going to be talking about selling on Amazon and how you can use copywriting to generate more sales. But before we get into it, if you can just give us a quick background about yourself and http://marketingwords.com and how you ended up focusing on or setting up on Amazon. Karon: Sure, marketing words actually started in 1999, so we have been online for seventeen years which is shocking every time I say that. It doesn’t seem like it’s been seventeen years. Robert: It is a long time. Karon: And I started out originally in marketing and advertising, working at different ad agencies and what I ended up loving the most out of the entire AD creation process was writing the copy. So when I decided to go into business for myself, that’s what I wanted my business to focus on was writing the words and that’s where our name comes from marketing words. So after we had been online for some time we do all sorts of online copywriting from websites to landing pages to the ads for P.P.C. campaigns for Google Ad Words or Facebook or whatever blog posts, you know pretty much any type of online copy. I had some clients that were manufacturers come to us and say hey we want to start selling on Amazon, can you help us out? So in the beginning it was trial by fire and as Amazon added more information over the years we began to pay attention and notice certain things and created our own special little way of doing Amazon product listings and Amazon keyword research so that our clients were getting some very impressive results. And we had people that would say you know I really want to learn to do it myself and those requests resulted in an e-book that I created a couple of years ago that has been updated several times because Amazon is always tweaking and changing things and the e-book is called “Amazon Advantage Product Listing Strategies to Boost your Sales” and that little e-book has just taken off like gangbusters. And I love to get feedback from people saying that the e-book and the worksheet that come along with it have really helped them gain some awesome success with their Amazon business. So we don’t teach people how to sell on Amazon, we teach them how to create awesome compelling product listings so they can make more sales on Amazon. So if you’re looking for someone to teach you the Amazon business that wouldn’t be us, but if you’re already in Amazon’s you know business and you’re sending products in to be fulfilled then this e-book is absolutely something that you should have. Robert: Okay Karon, thanks for clarifying and just giving us an overview and also congratulations of being in business that long especially online through the Bible you know there’s a lot of ups and downs, the landscape is always changing like you said, now Amazon is this huge market and you’re getting a lot of businesses getting in that’s trying to sell you different products and it’s amazing just to see the growth and the evolution of the Internet. It’s amazing even for you to be in business for that long and see all of that. So maybe then you can write another book. Karon: That would be a novel that would take a long time to write. Robert: Yes, so now let’s go briefly – how do you do copywriting, how can businesses use copywriting and especially people who are selling on Amazon to like making the products? How do you cope with it to get there? Karon: The first thing that you have to remember when you sit down to write an Amazon product listing is that unlike people that would go to Google or Being or even You Tube or any other type of search engine – the people that go to Amazon and start searching for things have a credit card in their hand probably eighty five percent of the time and they are on a mission to spend money right then. So if people are searching for silicone baking mat on You Tube They’re probably looking for demonstrations or ideas on how to use it. If they look for silicone baking mat on Google, maybe they’re looking at the ways that it’s manufactured or whether silicone is healthy for you or not, you know where they can buy them wholesale or something to that effect. But when somebody puts that search into Amazon’s search engine, they have the intention of spending money. So that in and of itself changes how you’re going to write a product listing. One thing that we see a lot of folks that have never created a product listing on Amazon before fall into is a trap of simply listing the standard features and benefits which is great. But when you are competing in an enormous marketplace like Amazon is you really need to be able to draw in those shoppers to your listing and help them visualize themselves actually using your product. So with our same example of the silicone baking mat instead of saying, “Lasts for years”, eco-friendly because it you know it isn’t disposable you’ll reuse it for years and has a non-stick surface or baked items and roasted I come off cleanly. All of these are features and benefits. But if you will help someone actually visualize himself using the product and this is something that infomercials do really well if you watch an infomercial you’ll see that they’re doing constant demonstrations. They’re showing you how to create recipes with the Nutri bullet or whatever the infomercial is that you’re watching and they’re giving your ideas. So by the end of that infomercial you’re thinking wow I really want to use this. If you can capture that same spirit in the copy do it you’re writing for an Amazon listing and do something to the effect of your homemade chocolate chip cookies will come off soft instead of broken and crumbly when you’re using this silicone baking mat or won’t pile up, won’t add to the pile up of unrecycled plastics because it’s eco-friendly and last for years. You know your husband’s favourite or your favourite barbecued ribs slide right off instead of being stuck with a sugary gooey glue. Something to the effect of showing them through words that they’re not going to have the trials and tribulations they might have had using something else. So that was – they’re picturing themselves. The last time I made ribs in the oven and had them on a regular metal baking sheet. It took me twenty minutes to try to scrape them off with a spatula. It would be so awesome if they just slid right off or I’m so tired of burning my grandmother’s chocolate chip cookie recipe every time I use a metal pan. It would be nice if they came off soft and chewy and gooey instead of me having to break them apart to get them loose from the cookie sheet. So all of these types of things help people go yeah that’s exactly what I need and that’s the type of copy that really converts well most of the time on Amazon. Every product is a little bit different and you have to tweak your approach accordingly, but generally speaking helping shoppers to visualize themselves using your product really works well. Robert: Okay, and can you actually apply the same principle of trying to get the cost of how much to visualise as you’re writing the title of these thing. Because when people do good on Amazon they do sciences and then you have such a result of this different products listed. So this is a type of creative writing applies to the titles that can grab their attention. Karon: No, and I’ll tell you I’ll tell you why. Amazon has a very strict set of rules and regulations and they are frequently broken. You will see people that use that approach when they’re writing titles on Amazon and they’ll get away with it for a little while. But as soon as it comes to Amazon’s attention, they will actually delist that product and send a nasty email that says your product has been taken down until you write a title that complies with our Terms of Service and there are and they are in the cellar central area of Amazon. There’s a lot of information in there about writing titles and all of the rules and regulations, what you can do what you can’t do. And one thing that Amazon stresses is that what they deem as “marketing language”. Number one bestseller. You know that type of thing with all of the marketing type of language that people would typically put in a title. That is not allowed and in many places Amazon will go so far as to say we reserve the option to close your account if we find out that you are using this type of hype filled language in your titles and in other area of your listings. So yes you will still see a lot of that on Amazon but its usually short lived as soon as it comes to Amazon’s attention they take action. Robert: Okay so that’s good to know and a good point and just make clear to the listeners. My next question is on keywords. But before we move on to the keywords was there anything else that we failed to mention as far as the copyrighting and the product listing? Karon: Oh yes we only have a twenty minute so there’s a lot we haven’t said. Robert: Yes I will try to record the Podcast in twenty minutes and still provide a lot of value. But the good thing is you do have people who can’t come to your website for marketing words, get the eBook for more details, but maybe we can mention maybe a couple more things before we move on. Karon: Oh absolutely. So what you said you had a question about keywords? Robert: Yes, before we move on to the keywords, is there something else or maybe one last bit we can cover on the product writing and copy listings? 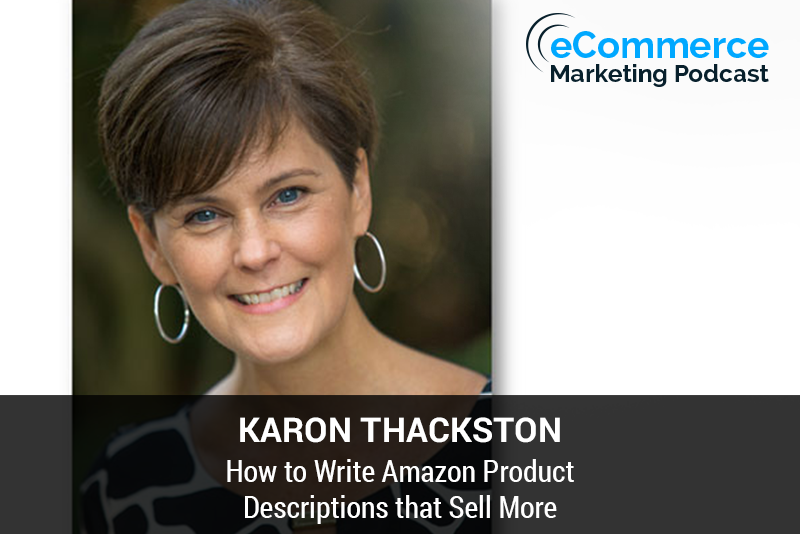 Karon: You have to balance what you write in your product listing between what Amazon says you can and cannot do and what you feel you want to do as far as the shopper is concerned. In order to do that you have to first understand what Amazon requires of sellers. So if sellers have not gone into seller central and downloaded what’s referred to as a style guide for the categories that they are selling in that’s one thing I would recommend that you do immediately and you will probably be shocked at what you are allowed to do versus what people have been doing and folks get so upset. Well I saw somebody that did it this way and that Amazon said the title was only supposed to be eighty characters and theirs was two hundred characters. I wouldn’t worry about that. Our recommendation is that you create listings the way that Amazon says they should be created. The main reason is there are some pretty serious consequences if you don’t. We’ve had several clients. There’s one testimonial about this up on our website. We’ve had several clients that came back to us when they decided that they wanted to adjust the product listing that we created for them because they just knew Amazon wouldn’t care if they did this thing or that thing or the other thing and ended up getting the nasty email from Amazon saying that it’s been taken down and a couple of our clients did it with several listings of theirs and Amazon was not going to reinstate their account because they had been sent emails about several of their product listing. So Amazon had them tagged as being abusive sellers and they were finally able to get their account reinstated again. But Amazon is getting very serious about it. So that’s one thing that I recommend. You may not like the rules but it is Amazon’s marketplace. So they have a right to say what you can and can’t do and our recommendation is always that you follow Amazon’s rules and their Terms of Service. Robert: Okay Karon, thanks for mentioning that. Now we can move on to the keywords. How do you find the keywords that you use in the product listing? Karon: It can start out in a similar fashion to doing keyword research for Google. If you have access to Google’s keyword planner and you like that tool – I’m not a big fan of it personally, you can use that to do some initial keyword research. However keep in mind that Google is going to be a compilation of every type of keyword and not just those that appeal to buyers, especially those that appeal to Amazon buyers. So one of my very favorite Amazon keyword research tools is http://amazon.com and just like Google they have a dropdown menu and you do a word search when you’re typing in something to the big white box at the top of the Amazon page. You’ll get suggestions that come up in a dropdown menu. Those are there because they are the most popular searches that people have done related to what you are currently typing in. So paying attention to what is coming up in that box is very important. There are also tools like fresh key and SEO chat that offer a tool that will allow you to type in a particular key phrase and it will go through Amazon. For example if we go back to our silicone baking mat, it would go through and put silicone baking mat and then it would automatically run through silicone baking mat and it would put in a at the end of it and then it would do silicone baking mat and it would put an “A” at the end of it and it would do silicone baking mat and put a “B” at the end of it, maybe someone was looking for silicone’s baking mat bulk to buy many of them, silicone baking mat “C” for cookies or something like that. So it’ll do all of that instantaneously, well I won’t say instantaneously but within just a matter of seconds, fifteen or twenty seconds it will do all of that for you. Fresh key I want to say is maybe ten dollars, onetime fee and as S.E.O. chat for Amazon keyword research is online and it’s free. So it depends on what you’re looking for. Robert: Like the SEO chat, what website would you go to? Karon: seochat.com and you have to look in the tool section. The link is some awful horrible dash equals question mark something, something, something. But you can just go to http://seochat.com and look in their tool section and they’ll have it there for you and fresh key – let me pull up a browser that may just be http://freshkey.com. I saw a video on YouTube a couple of weeks ago that actually had that for ten dollars. I don’t know if that’s the permanent price now or not, let me back up. Let me see and it’s got a video that starts playing as soon as you get there. On the website it says it’s forty nine ninety five. So search for fresh key on YouTube first if you’re interested in that because I did see somewhere – it’s been too long ago to remember, but I did see one where they had an offer to get it for ten dollars. Robert: Okay but once you find all these keywords by using those tools you’ve mentioned, do you just like how you optimise for Google and other search engines, do you use those keywords in your other product listings, is there like a sudden limit you should use, where should you use them? Karon: In Amazon, most things with Amazon keyword research are the complete opposite of Google Keyword research. Amazon does not use exact match key phrases the individual words within a phrase are all searchable on their own, in any order. So those terms that you find need to go into the product name, the title and also Amazon has specific search term fields in the seller central area when you set up a product and your search terms need to go in there as well. You can sprinkle them around in your copy. It is not necessary to repeat keywords on Amazon. So if it’s in the title, you don’t need to put it anywhere else. If it’s in your search term field you don’t need to put it anywhere else. It isn’t a problem if you do. I mean when you’re writing copy naturally you’re talking about the product so those search terms are going to come up in there – your bullet points in your product description naturally anyway just because you’re talking about a silicone baking mat. So you would have to say that at some point but it isn’t necessary to repeat it three four five times or what have you. One time gets it done and you only need to put it in one place, you don’t have to put it in all the different places. Okay, thanks for clearing that up and the last question that I have is some of the common mistakes that some sellers make. What are some common mistakes sellers should avoid when it comes to selling with copywriting on Amazon? Karon: One problem that I see sellers running into that create their own listings is thinking mistakenly that more copy is better – that a longer title will work better than a shorter title, that longer bullet points will work better than shorter bullet points. This is not true most of the time. Now again every single product listing is different so there are exceptions to every rule. But as a general rule you don’t need to have five hundred character bullet points. That’s just too much in an e-commerce environment. People don’t like to read when they’re shopping online for things. So it’s actually better to have the bullet points in an Amazon listing at somewhere between eighty and two hundred characters. Amazon’s preference is that you do eighty eight characters and they are now in the process of going through and changing some of the category requirement so that bullets can only be one hundred characters or less. And they haven’t done that in every category yet. Some other categories where I guess they feel more detail has been official might have a limit of one hundred fifty characters for bullets or two hundred characters for bullets. But when you get too much copy on an Amazon product listing it’s difficult to read and so people don’t they just skim very, very quickly and they miss information that you may have put in there and that can cost you sales. And something else that people don’t understand is just what we were talking about a minute ago the severe differences between Google Keyword research and how to optimize a web page that is trying to rank well on Google and Amazon keyword research and how to optimize an Amazon product listing. And they are like I said almost exact opposite with just a few exceptions. So before you begin to write a product listing you not only need to get some training on how to creatively persuade people with your copy but you also as equally important is to get some training on how to do Amazon keyword research and optimize an Amazon product page because it is very different from doing it from Google. When people just dump in we have a lot of folks that used to be e-bay sellers in e-bay doesn’t have all of these rules and regulations you pretty much just put whatever you’re going to put and there you go. So when folks come over and they start copying e-bay listings into Amazon and nothing happens they don’t rank well, there listings don’t get seen and when they start getting traffic they don’t convert. Part of the problem is they have no understanding of just how different Amazon is. It’s his own different little world when it comes to selling and it isn’t like e Bay and it isn’t like Google and it isn’t like anything else. So getting proper training is probably the best thing you can do to help ensure that the product listing you create rank high on Amazon and that when you get traffic to those product pages they actually convert lookers into buyers. Robert: Thanks Karon for sharing all this information of definitely – I’m getting to understand Amazon because usually Amazon is not a marketplace that I understand more of a softer, more of the different shopping carts like the Shopifiers more than they do Amazon but I really appreciate you coming on the show, clearing all these things and just making it easy for me to understand and I think the listeners do appreciate everything you’ve shared. For our listeners how can they find you, what’s your tweet and also what’s the name of the book again – the eBook that you have and where are you selling it? Karon: The e-book title is “Amazon Advantage Product Listing Strategies to boost your sales” and you can find it on the marketing words site at http://marketingwords.com/Amazonbookmarketingwords.com/Amazonbook and I would like to offer your listeners a twenty percent off coupon code. They can use the code amz20. There’s no spaces in that – amz20 and save twenty percent off if they decide to get the Amazon Advantage eBook. So that will help make it a little bit more affordable especially for those who may be pinching pennies right now trying to save a little bit of money as they invest in inventory for their Amazon businesses. I’m around – Facebook is the social media site that I’m on the most and you can find is that http://facebook.com/marketingwords and if people like Twitter better I use my name on Twitter and it’s spelt Karon Thackston and they can find me here at Karon Thackston on Twitter. Robert: Okay Karon again thanks for being on the call with us. Karon: Thank you so much. I hope you have a great afternoon. Robert: You too, take care.